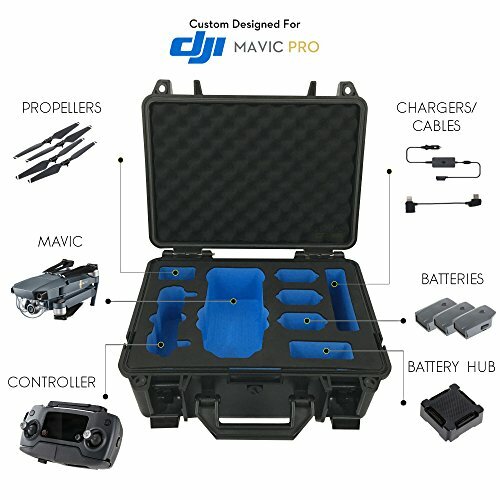 USA Seller - We are a US company who stand behind our DJI Mavic Pro Case products. PRECISION CUT FOAM INSERT - The Finest Safety Material is Used in a Black Over Blue Look that Gives your Drone the BEST PROTECTION and Snug Fit with an Awesome Presentation. Holds DJI Mavic Pro Drone, Controller Transmitter, 3 Extra Batteries, Charging Hub, Propellers, AC Adapter and more. IP67 WATERPROOF RATING - Can be Submerged up to 1 meter for up to 30 minutes so you don't have to worry about ocean waves, streams, or getting caught in the rain. Dustproof so you don't have to worry about getting dirt in your drone. MADE OF STRONG RUGGED ABS - Shock Absorbant Material Will Give your Product the Best Protection from Drops, Weather, Sun, and Earthquakes. LOCK IT UP - Dual locking features allow you drone to be locked up safe and water resistant giving you even more security and theft protection. COMPACT TRAVEL CARRYING CASE - Small, lightweight, inexpensive, waterproof, portable and carry-on sized case to transport your quadcopter on the go. Easily slips into a backpack. If you have any questions about this product by Veritas Case, contact us by completing and submitting the form below. If you are looking for a specif part number, please include it with your message.